You are currently browsing the SafeSourcing Blog blog archives for June, 2015.
Business as Usual? 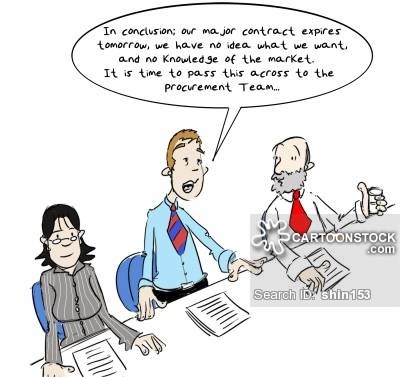 We Should Hope Not When It Comes to Contracts! Do you have a contract expiring soon? Or are you working from a contract that already expired months or years ago and have not done anything with it? Now is the time to act, do not let your contract go on any further until you know for sure it is beneficial to your company. How do you go about making that assurance? By doing a lot of research and homework first and foremost, and asking those who need the goods and services on the contract if there are any changes, modification, recommendations that they would like to see. Many times goods are purchased through the supplier you have always worked with…or why rock the boat when it has always worked great for your company in the past. In either circumstance, it is great you have confidence in your supplier or their product; but are they offering you the best product, warranty, certifications, services, pricing, and even net terms? By running a RFI to gather information from your supplier’s competition, you can determine who’s who in the category. By running a RFP you can see if they can implement the same, or better pricing, or net terms. Running a RFQ with all the suppliers, including your supplier or incumbent, you can be sure they are competitive in their pricing, terms, and goods. It is never good business practice to let a contract expire or work from an expired contract. SafeSourcing can assist you in exploring your procurement solutions for your business or on our “Risk Free” trial program, please contact a SafeSourcing Customer Service Representative. We have an entire customer services team waiting to assist you today. What can you do to save energy and money? Everyone likes to save money. There are many things that you can do around your house to save energy and money. Some of the improvements can be costly such as replacing appliances with Energy Star appliances. There are also many inexpensive things that can be done by you in your spare time. With the improving technology there are some cool gadgets that can be installed to help. For instance, installing a smart thermostat that learns your behavior and creates schedules for heating and cooling. They also make devices that help reduce water consumption in your shower. These devices work by decreasing the flow of water when the water reaches a certain temperature and when you are ready to shower, the flow of water will increase. Some of these devices are also Wi-Fi enabled and record usage and water consumption. This data can be viewed with an app that you install on your smart phone. Below are some other things that can be done as well. If you would like some help researching some of these products, we can gather all the necessary information for you and help you decide which solutions meet your needs. If you would like more information on how SafeSourcing can help you, please contact a SafeSourcing Customer Service representative. We have an entire team ready to assist you today. Procure to Pay analysis requires careful planning Part II of II. In yesterdays post ?Procure to Pay analysis requires careful planning Part I of II? we began to answer a customers question as to were they actually getting all of the savings from the low quotes in their online RFX process. Here is an example of what might happen or actually does more often than not as result of the actions in?yesterdays post. If we come up with the math from?yesterdays scenario, it takes a full quarter to execute which is not a stretch at all. Unfortunately your incumbent supplier was not selected and your contract with them expired 5 weeks ago. Now your out of contract costs are now up by 5% for the last five weeks because you are not so important to this supplier any longer. So not only has your existing price gone up for the last 5 weeks, you lost the opportunity to buy the product from your new supplier at 20% less over the same five weeks. These combined costs now erode your total estimated savings with your new supplier who you probably have not even added to your accounts payable system which will also result in late fees. Ask your e-procurement solution provider how they can help you with this process. Or, please contact a SafeSourcing Customer Services Account Manager in order to learn more. There are many color idioms in the English language, some more familiar than others, and learning just a few can benefit your work. Find out what they mean and how they could apply to you. Red ? ?In the red? This phrase is one many of us have heard and refers to a place none of us want to be. It refers to financial accounts, where going below zero means those accounts are in the red. In dire situations like this, a person may be ?shown the red card?, or dismissed from a job. Black ? ?In the Black? This phrase is not as commonly used and is the opposite of ?in the red?. It also refers to financial accounts, where they are well above zero. It also is used to describe someone or something as successful or profitable. Blue ? ?A bolt from the blue? Like a sudden lightning strike, this refers to unexpected bad news. News like this can ?make you feel blue? or saddened, but hopefully only happens ?once in a blue moon?. Green ? ?To be Green? Not to be confused with ?going green?, which refers to being more environmentally sustainable,? although ?to be green? does stem from nature, when new plants and trees are green when they first sprout, the idiom refers to a person being inexperienced. Green can refer to other positive things as well, like ?getting the green light?. This means that a project or plan has been approved and can proceed as desired. Orange ? ?Apples and Oranges? Although this idiom refers to the fruit and not the color, it is still an important one to know. It is used to reference two unrelated items and because of differences, cannot be compared in like ways. Black, White, and Gray ? ?Black and White? This refers to definite outcomes, like yes and no or good and bad.? ?Shades of Gray? refers to all the areas in between the black and white ends of the spectrum, where something is not simply good or bad, but more complicated than that. If you find yourself in the red or facing the red card, possibly after a bolt from the blue, call SafeSourcing and see if our team can get you back in the black. We go green, but our team isn?t green and with the green light, we can help. For more information on how SafeSourcing raises the industry standard for customer service, or on our ?Risk Free? trial program, please contact a SafeSourcing Customer Service representative. We have an entire team ready to assist you today. In Canada, it?s as simple as visiting the Health Canada Website. According to Wikipedia Health Canada (French: Sant? Canada) is the department of the government of Canada with responsibility for national public health. Here you can find news releases, speeches, media notices and research a variety of data related to health and food safety within Canada. Just as a recent post titled? ?Buyers; Do you need a great place to research product quality and recall issues? that talked about The U.S. Consumer Product Safety Commission? the Canadian Government has many tools that buyers can use that also cost nothing. You just have to spend a little time on their site. Sometimes the best tools are the ones you don?t have to pay for. If you?d like to learn more about SafeSourcing tools that are free for your use, please contact a SafeSourcing customer services account manager. Don’t Call me a BUYER! So just what is a Category Manager? Todays post is from our SafeSourcing Archive, with much respect to all of the Category Managers out there! If you lack any of these skills on your team, contact a SafeSourcing customer services account manager to see how we can help elevate the performance of your procurement team. Yesterday we looked at the planning that needs to go into the initial phases of Request For Proposal meetings to make them successful. Understanding the format and agenda are key ingredients to structuring the evaluation of the presentations and in helping guide the vendors on what needs to be talked about or shown. Today’s blog will wrap up this two-part series by focusing on the final details and the structure for formally evaluating the presentations in a way that will ensure the comparison criteria are as similar as possible. Fill in the RFP holes – No matter how much time is spent preparing an RFP there will always be holes of information created either by missed content or by new questions arising from how the vendors initially responded. Many times this will include clarification on pricing models, more depth on service and how it is measured or a deeper dive through a live demonstration of the features of a software tool that is being highlighted in the vendor’s offering. While there will still be time to follow-up with questions after this meeting, it provides a great forum to level each vendor’s solution with the others. Scoring made easy – The biggest pitfall many companies fall into when organizing their RFP presentations is determining how they will evaluate the presentations of each vendor. Having a high-level agenda is a great start and will go a long way to providing a side-by-side view and sometimes that is all that is needed. Frequently, however, especially with software solutions, giving the vendors a script or use-cases to demonstrate will help build an internal scorecard that can be used to score and evaluate each feature and piece of functionality. Some vendors choose to publish the scorecard in advance to the vendors so that they know what pieces will be evaluated and sometimes this scorecard is kept for internal use only. Housekeeping details – Once the dates & times, duration, format and content are decided and delivered to the vendors, the final piece will be to ensure that the vendors have the final “housekeeping” details for the presentations. If an online method is chosen, this will mean ensuring a webinar invite has been prepared and sent with a tool all evaluators can use effectively. If an onsite presentation is chosen, making sure that the address and contact details have been provided to the vendors so they know where to go and who to ask for when they get there. Publish or solicit the need for internet and projector requirements and provide the vendors with the list of people who will be attending as well as receive the list of their presenters in case security needs the information in advance for onsite meetings. A Request For Proposal is a very valuable information gathering process by which companies are able to gather the what is needed to make important decisions. Seeing the process of planning all the way through the end will ensure the best comparisons can be made and turned into decisions that provide the company with the most value. For more information about SafeSourcing or on our “Risk Free” trial program, please contact a SafeSourcing Customer Service Representative. We have an entire customer services team waiting to assist you today. 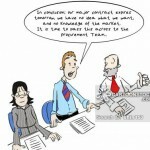 Cutting Jobs to Cut Cost is NOT always the RIGHT Answer…..
Todays post is from the SafeSourcing Archive. The first thing that seems to come to mind for Many companies when faced with financial struggles is cutting jobs in order to save money. For this author, this is not always the best decision for the company even though it is almost always the largest expense on the P&L. When a company cuts jobs, it not only puts stress on the people whom are losing their jobs, but it also puts stress on the company and employees that remain. These employees have to work harder to accomplish the same amount of work. The workload does not change when cutting jobs, so now an employee has to take on the workload of former co-workers who were laid off in order to get the job done. This can put additional stress on these employees and result in them not accomplishing their best work. When a company is faced with financial struggles, a company like SafeSourcing could come in and potentially save some of these jobs. I have personally seen SafeSourcing save companies hundreds, thousands, and even millions of dollars by assisting them in the purchase of materials, supplies and services they need and use every day in order to run their business. For example, copy paper, printer ink, POS paper, etc. SafeSourcing can help you source any product, good, service, you name it. If you were to contact SafeSourcing in order to help you save money, you may not have to cut those jobs and could even potentially add jobs to the company. I’ve seen this first hand. Contact a SafeSourcing Customer Service Representative for more money-saving details.